Indian Chicken Korma Recipe is a traditional Indian curry, which is usually served with naan or rice. It usually has a rich and flavorful curry made from a paste of cashew nuts or almonds. It gets a vibrant flavor from a handful of a mix of spices. Learn all about Indian Chicken Korma recipe and my shortcut method to make your favorite Indian curry right at home. Okay, so I have a confession. I don’t make this Indian Chicken Korma recipe from scratch. I use a ready made spice mix, easily available at Indian stores (and in big superstores as well). This allows me to quickly make Indian Chicken Korma right at home, without even having to make a paste of cashews or almonds! Really, that’s how easy it is. I love to make this Indian Chicken Korma recipe for dinner parties at home, because it’s super easy but it tastes like you slaved for hours over it. Hehe. What spices used are in an Indian Chicken Korma Recipe? These are the aromatic spices which when combined, make a delicious Indian Chicken Korma recipe. 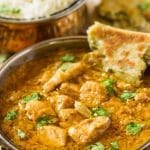 How Do You Make Indian Chicken Korma Recipe? 1.) In order to get this deep rich color and flavor for the Indian Chicken Korma recipe, we need to start with caramelizing onions. Red onions are used here because they caramelize faster than other varieties and they have the right sweet flavor for this curry. 2.) Then these caramelized onions are blended with thick, creamy yogurt, so that it sort of becomes a flavor base. Okay, so now let’s put this carmalized-yogurt base on the side while we get to the other elements of the recipe. 3.) So now we add chicken to the same pot as the one in which we carmalized the onions. Add some garlic ginger paste and fry on high until the chicken changes color. 4.) So now comes the sneaky shortcut. Look, I don’t claim to be an authentic curry maker, even though I’m from South Asia and you would think curry runs through my veins and that I’m some sort of exotic spice mistress. Sorry to burst your bubble, but I’m no expert on making special spice mixes for curries. So let’s give a very warm welcome to our helpful, ready-made spice mix Shan Korma Masala. This Shan spice mix is the best friend to all our curries cos ain’t nobody got time to grind and make fresh spice mixes these days. Right, right? Okay, so now with just a flick of our wrists, we add a bit of this Shan Korma Masala and cook the chicken until the spices wake up and the aroma of rich curry wafts through the kitchen. 5.) And with a few more simple steps such as adding the caramelized-yogurt base and a bit more of cooking, you have the perfect, satisfying curry ready for a relaxing dinner at home. Where does Indian Chicken Korma recipe originate from? Looking for more easy curry recipes? 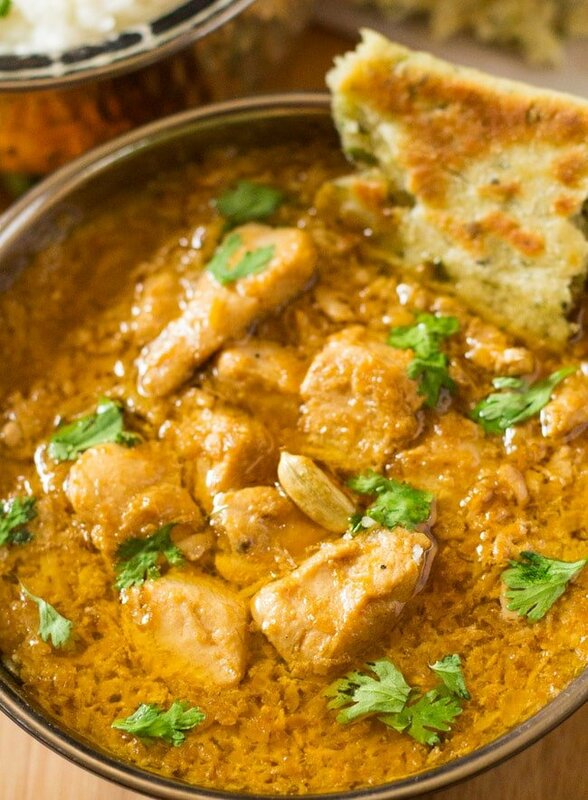 Indian Chicken Korma Recipe is a traditional Indian curry, which is usually served with naan or rice. It usually has a rich and flavorful curry made from a paste of cashew nuts or almonds. It gets a vibrant flavor from a handful of a mix of spices. 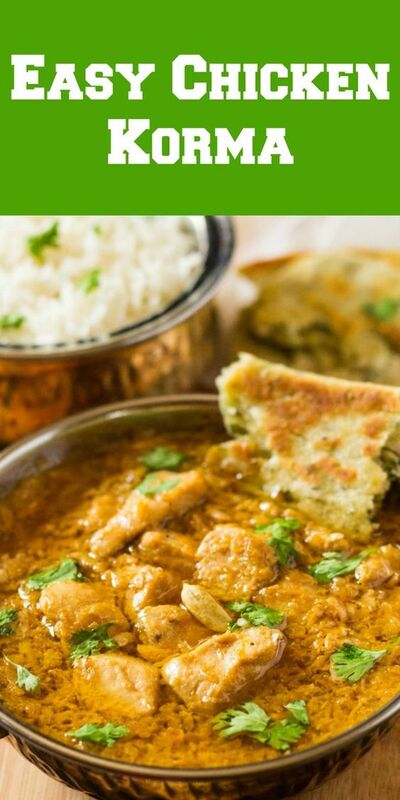 Learn all about Indian Chicken Korma and my shortcut method to make your favorite Indian curry right at home. In a large pot, heat the oil and add the onions. Fry the onions on a medium high heat until caramelized and golden brown. The onions should be a deep, dark brown but not burnt. Take out the caramelized onions and place on kitchen paper to drain excess oil and let cool for a few minutes. Add the caramelized onions and yogurt to a blender or a food processor and blend until smooth. You may need to add 1-2 tablespoons water to get a smoother paste. Set aside. In the same pot, add the chicken and ginger garlic paste and cook on high heat until the chicken changes color and is no longer pink. Add the Shaan Korma Masala and salt and cook for 5-7 minutes until the oil separates and you can no longer smell the rawness of the spices. Add the yogurt-caramelized onions paste and water. Cook until it comes to a boil. Reduce the heat to medium-low, cover and let simmer for 15 minutes until you can see the oil separating from the curry. Take off lid and bring to another boil by increasing the heat then and turn off the stove. Garnish with chopped coriander. Serve with naan and white rice. 1) How should the onions be prepared? Are they sliced? Finely chopped? If you add cashews and golden raisins at the end it is really traditional. Can I use something else in place of korma masala,as I don’t have it now with. Me,any alternative? It’s soooo okay to use a spice mix! 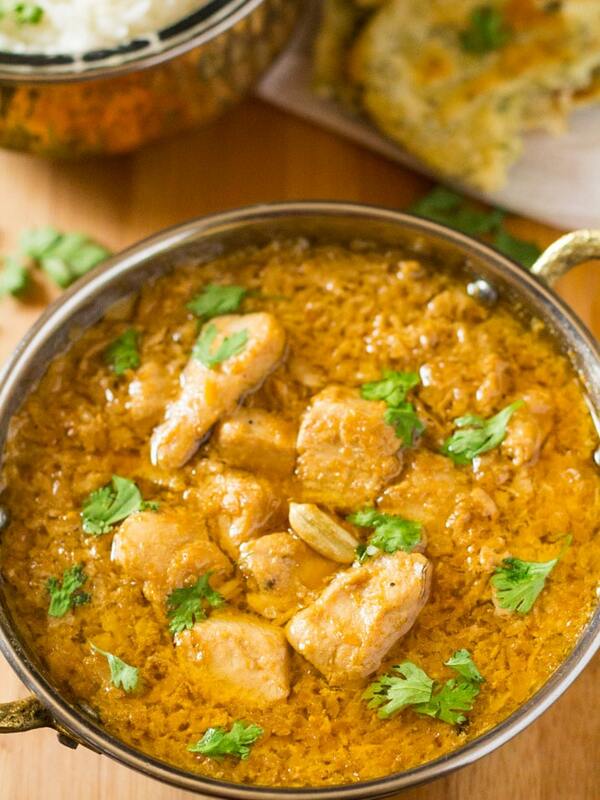 This Korma looks so delicious! It’s pure comfort food and so hearty! I always love ordering chicken korma when I’m out. I’ll definitely have to give this a try. Thanks for sharing! I can’t believe how easy this recipe is! The flavors are so complex, yet the steps are so easy for everyday cooking. Just pinned this beauty…thanks for sharing! Can’t wait to make it! Sounds delicious! Caramelized onions are one of my favorites. Love all the background information you included and variations. OMG! 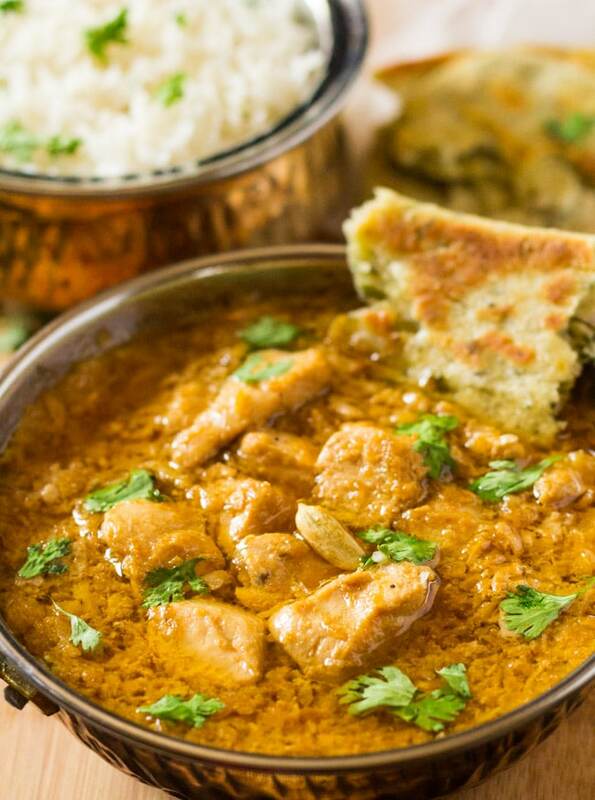 I love Indian cuisine and this Chicken Korma is just calling my name. Thanks for such a great recipe. I’ve never attempted to make one but now I am totally inspired.